Alaia 1980's Red Leather Skirt Suit with 2 front zip pockets and back inverted pleating. Skirt has a size zip and snap closure with a back vent. Skirt is also fully lined and contains belt loops. *ALL MEASUREMENTS TAKEN FLAT* Jacket Label Size: 36" Shoulders (seam to seam) : 16" Sleeves (shoulder seam to wrist) : 23.5" Armpit to armpit: 34" Waist: 25" Total Length: 21.5" Skirt Label Size: 38 Hips: 35" Waist: 25" Total Length: 27"
Alaia metallic lurex knit crop top and skater skirt with internal mini shorts. 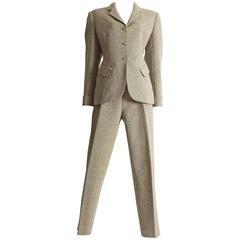 Alaia suit constructed in cotton, spring-summer 1988. High waisted mini shorts and boxy cropped blazer jacket with button closure.